2016 Ssangyong Korando Sports DMZ review | What Car? ‘A bit of fun’ is how Ssangyong describes its latest pick-up truck. 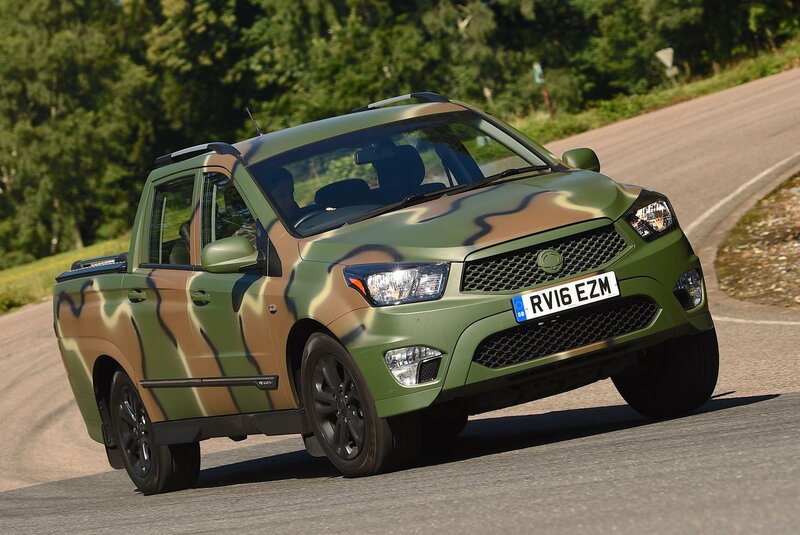 Named after the infamous demilitarised zone along the border of North and South Korea, the Ssangyong Korando Sports DMZ is a limited-edition twin-cab inspired by the latter country's military vehicles. It’s based on the range-topping EX auto version of the Korando Sports, and comes with an impressive array of standard kit. In addition to the distinctive – albeit questionable – paint scheme, the DMZ has air conditioning, heated leather seats, cruise control, Bluetooth connectivity and rear parking sensors. Meanwhile, roof rails, 18in wheels and an optional aluminium checker plate tonneau cover complete the beefed-up look. Only one engine is available: Ssangyong's own 2.0-litre diesel that’s good for a solid 153bhp. The presence of sophisticated multi-link rear suspension should – on paper, at least – give the DMZ a dynamic advantage over its leaf-spring equipped rivals. At £23,034, it's unquestionably well priced, too. What is the 2016 SsangYong Korando Sports DMZ like to drive? Despite the clever suspension, the DMZ suffers from surprisingly poor body control, pitching and rolling significantly more than its competitors. This is particularly pronounced on tight and twisting country roads, even when travelling at relatively sedate speeds. The DMZ also has horribly vague steering and struggles for grip more than most rivals. On our cross-country test route, it was troubled by corners that left the latest Ford Ranger and Toyota Hilux completely unphased. Things aren’t much better on the motorway, with small undulations causing the DMZ to bounce up and down in a seemingly uncontrolled way. Combined with the intrusive wind noise from around the door mirrors, it makes for a very tiring driving experience. Only the engine impresses. It pulls strongly from low revs, has a healthy appetite for revs and is even reasonably quiet. Unfortunately, its 37.7mpg average fuel economy figure is well short of those of its best rivals, and it’s somewhat undermined by its five-speed automatic gearbox, which is slow and dim-witted at low speeds. True, there is a manual override, but this function is so sluggish that you quickly find yourself knocking the selector back into automatic. 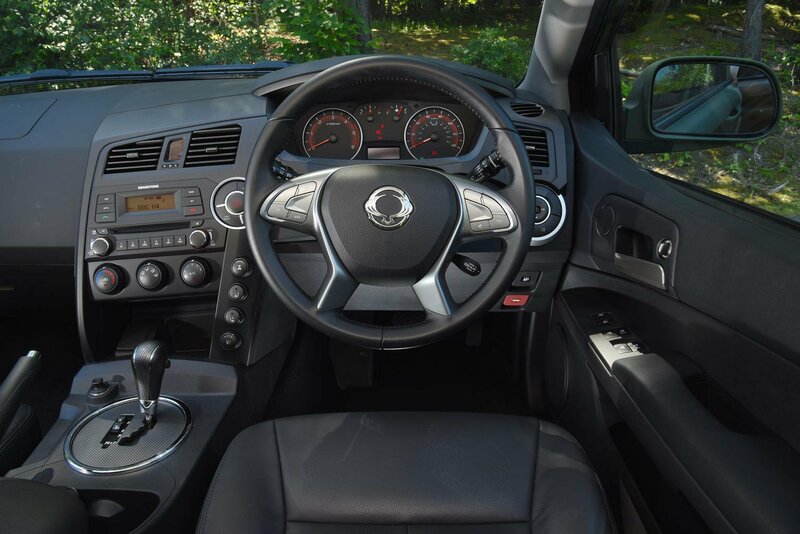 What is the 2016 SsangYong Korando Sports DMZ like to inside? With vast swathes of hard plastics adorning the dash, the interior feels a good few years behind the competition. The seats offer little support in corners, the leather wrapped steering wheel feels distinctly un-leathery and the orange dot matrix clock looks like something from the 1980s. Even with the impressive array of standard equipment, you can’t help but think that it’s all a bit bargain basement. Ergonomically, the DMZ fares a bit better. There’s plenty of room up front, the driving position is reasonably comfortable and visibility is good. 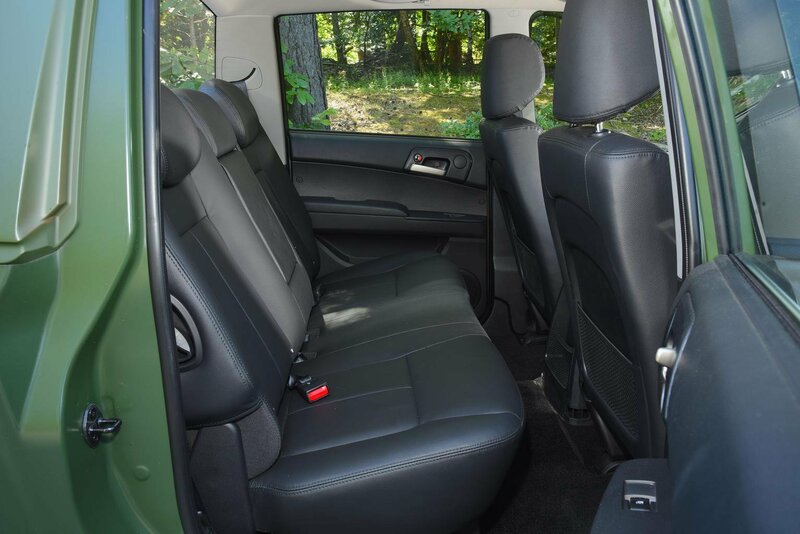 Plus, thanks to the double-cab layout, there are proper rear doors that make access to the back seats relatively painless. If only there was a bit more space; children will be happy enough in the back of the DMZ, but long journeys will be a chore for even averagely tall adults. 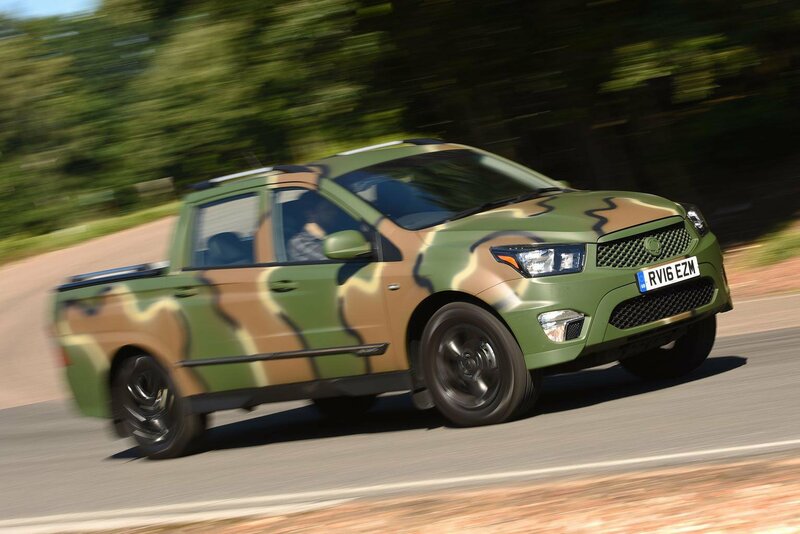 Like the rest of the Korando Sports line-up, the DMZ makes for a solid work vehicle. It can tow trailers weighing up to 2700kg, has a 1,000kg payload capacity (which qualifies it as a commercial vehicle for tax purposes) and its two-metre square bed can easily accommodate a Euro-pallet. There’s no denying that you get an impressive amount of equipment, but cheaper versions of the Korando Sports make more sense than this DMZ version. While rivals such as the Ford Ranger, Toyota Hilux and Volkswagen Amarok offer modern interiors and car-like driving characteristics, the Korando Sports feels like it was designed in a different era. 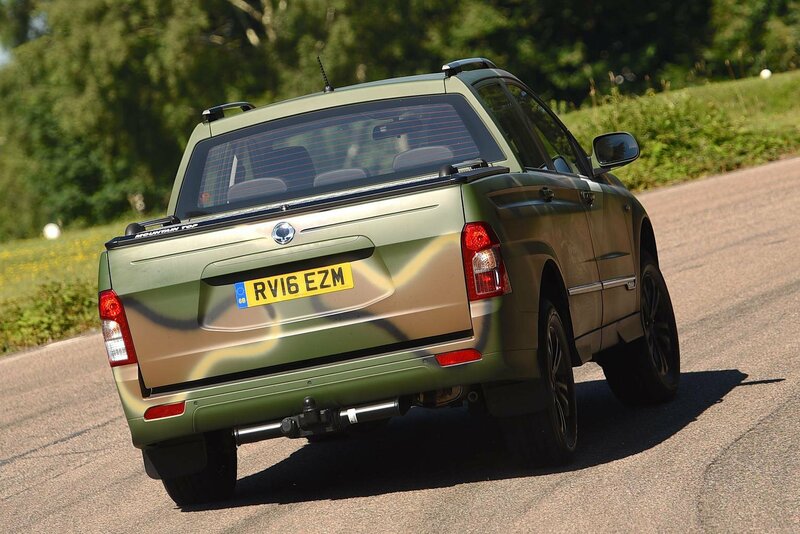 Ultimately, if Ssangyong wants to compete in this war zone of a market – if you'll excuse the pun – it will need more than just a novelty paint job.